Artwork Beef automatically adds extra artwork for media in your library. It is generally intended to handle extended artwork just as Kodi and scrapers already do for basic artwork. It grabs artwork from the wonderful web services fanart.tv, TheTVDB.com, The Movie Database, and TheAudioDB.com. It is developed for Kodi 17 Krypton, and should also work for 16 Jarvis and 18 Leia. 15 Isengard should mostly still work, but it's really time to update. 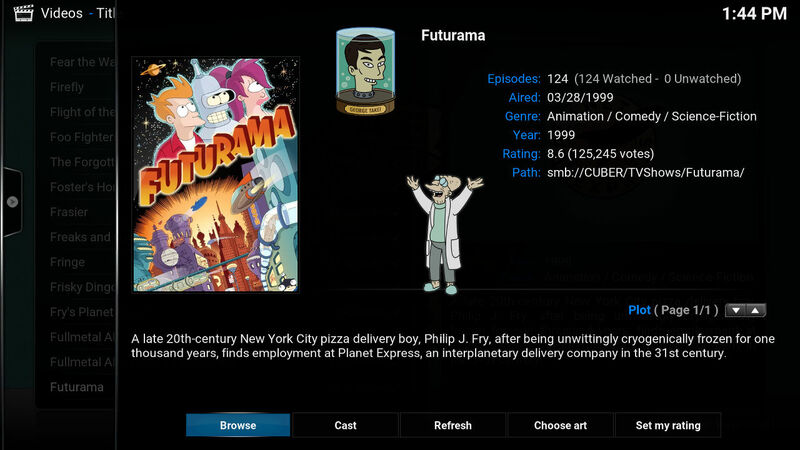 It fully supports series and season artwork from TheTVDB.com; movie, movie set, music video, series, and season artwork from fanart.tv; movie and movie set artwork from The Movie Database; and music video artwork from TheAudioDB. For those series that really pop, high quality fanart for each episode can be added from The Movie Database. Music library artwork is supported in all Leia nightlies from 2018. Install my dev repository to get updates delivered to you automatically. After the repo is installed, Artwork Beef can be installed from "Program add-ons". Artwork Beef can also be installed with a single zip file, but you will have to return here for updates. Artwork Helper can be installed with this single installable zip for Kodi 17 and above (or this one for Kodi 16 and below), but it's only necessary if a skin depends on it. Inclusion in the official Kodi repo isn't likely for now; some of this functionality may make its way into Leia so it will probably see some feature churn before long. These URLs will always point to the latest stable version. For full information see the documentation. 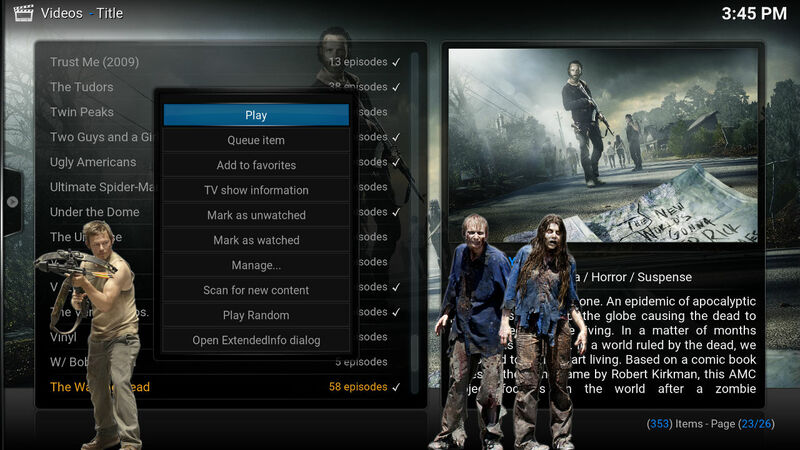 See the Kodi wiki for information on Kodi's built in artwork capabilities. If you have any questions, read the documentation first. Movie thumbnails / extrathumbs aren't added from external sources. There is no way to tell the difference between stills and press/marketing images from the web services, while thumbs should only include stills. Skins can try multiple fanart for a similar look. Generating more than one thumb from a video file is outside the scope of this add-on, but any provided by a media manager is added to the library. Plugins can also set these to the ListItem, if their source provides more than one thumbnail. It would be nice to have a Kodi built-in way for skins to feed multiple art to a `multiimage` control, maybe something like `$INFO[ListItem.MultiArt(fanart)]` to pull all `fanart` and `fanart#` together. I have no idea how it could be implemented in Kodi, though. Those where my thoughts. What are yours? Skinners, viewers/end users, developers, anyone, I'd like to hear what you think. Source hosted on GitHub. Do not install directly from source, use one of the two options above. Make sure you have the latest version of Artwork Beef (see the change log for the latest version available). Include (1) the exact version numbers of Kodi, Artwork Beef, and the OS you are using along with (2) a detailed description of the problem in a post here on the thread. I will need (3) the Kodi debug log file to fully understand your problem; while recording the debug log run the process that you are having trouble with. If there are relevant lines in the standard log then I might be able to work with those (for those intermittent problems that are difficult to catch in a debug log), and (4) the artwork report (userdata/addon_data/script.artwork.beef/artwork-report.txt) can also have some useful info. Configuration for Artwork Beef is can be complicated, so it may be helpful to post (5) your Artwork Beef "settings.xml" file (remove the lines that include "apikey" or "fanarttv_key" if you have set them in the configuration) - it can be found in "userdata" next to the artwork report. If your problem is with identifying local artwork, (6) a screenshot or listing from the file system for an affected media item and its artwork can also be helpful. The more items you include, the more likely it is I can help you. Nice and all but i will push my updated Artwork Downloader soon to repo with all this already completely done and more. I said I was busy with other stuff and would push everything when i was ready. (2016-02-05, 12:10)Martijn Wrote: Nice and all but i will push my updated Artwork Downloader soon to repo with all this already completely done and more. Cool, looking forward to it. I would have rather contributed to Artwork Downloader, but several months and not one response to multiple requests for an update made it seem clear you were uninterested. I will continue to work on Artwork Beef while I need it, and yes, I will have fun with it. When trying your addon I get an artwork beef error at the top left. You mentioned other python modules, which ones would I need? Installing my dev repo to Kodi then installing Artwork Beef from there should install everything it needs. I just got a bead on issues with Python 2.6, so if you are on Android, I'll have a fix in the repo soon. Otherwise, go ahead and post your log file, as there is probably something else going on that I will need to look at. If you pulled the single Artwork Beef zip from the repo, you will also need script.module.lockfile, script.module.cachecontrol, and script.module.devhelper zips from the repo. Install lockfile first, then the other two, then you should be able to install Artwork Beef. (2016-02-06, 22:14)rmrector Wrote: Installing my dev repo to Kodi then installing Artwork Beef from there should install everything it needs. I am using android with the issue, the pc one works ok. I've fixed up these add-ons to support Python 2.6, Android, and Isengard, with updates in the repo. @Repoman - please read the rules concerning banned add-ons (wiki) before requesting help here. We do not support any installation that contains them as they violate our forum rules (wiki). No changes were done few days after Martijn comments. Got any news from Martijn ? After 0.4.0 a couple of weeks ago, I had a bit of an existential crisis on behalf of the Beef, as I'd really like to see Kodi support all artwork as it supports basic artwork, which would cover everything I really wanted this add-on to do. A change like that in Kodi is pretty hefty, though, and well outside my C++ comfort zone, so I will likely end up coming back to this add-on in a week or so. I think you are right, Kodi should support them all. I have finished up version 0.5.0, which comes with a handful of changes, the biggest is loading artwork from NFO and image files next to your media. Further details in the first post. Add-on settings have been fleshed out, error handling has been improved, and other bits have been polished up. I've also enabled multiple characterart to be selected. I had some fun goofing with these, like the Professor worships George Takei, or Daryl stalking zombies. It still defaults to a single image.